Oinatz Bengoetxea and Ruben Beloki last night made it three wins out of three to climb to third place in the championship standings. While the Asegarce pair have overcome their slow start to take their place among the favourites to progress, Titin and Pascual are heading in the other direction; they now lie seventh and should be very worried indeed, especially given their points difference only of +1. They could still qualify for the semi finals but they have not made it easy for themselves. The Asegarce partnership triumphed not by whitewashing their opponents but through hard work and intensity of effort. Despite finding himself on the losing side, Pascal was the best of the four pelotaris on show. It was Titin who allowed the victors their upper hand; the man from Tricio played without inspiration or spark and as the confidence of the Aspe pair gave way, Bengoetxea pounced. Although the manomanista champion committed six errors, he was able to keep his forward opponent at bay, and together with the solid hitting of Beloki from the back, was able to keep Pascal contained by applying sustained pressure rather than searching for out and out winners. Although the match was a close one, Bengoetxea and Beloki showed impressive composure to take the spoils, turning a 19-20 deficit into a 22-20 triumph. Scoring sequence: 0-2, 1-2, 1-3, 3-3, 3-5, 5-5, 5-6, 8-6, 8-9, 9-9, 9-11, 10-11, 10-13, 12-13, 12-14, 17-14, 17-16, 18-16, 18-19, 19-19, 19-20 and 22-20. This has been a long time coming. For much of this tournament, Asier Olaizola has been forced to watch little brother Aimar scale the heights while he and his partner, an out of form Patxi Ruiz, plunged the depths. They remain lowly in terms of the overall table but they can now rejoice in a performance which has saved their faces. They hang onto a mathematical chance of qualification for the semi finals thanks to this win over fifth placed Titin and Pascual, although they would need a miracle. Their opponents for their part have failed to gain a crucial point as the fight to reach the last four hits fever pitch and will wait anxiously on other results this weekend to find out where they will stand as they enter the penultimate week. The first four points of the match seemed depressingly like business as usual; Patxi hit short from the back, as has been his wont in almost every encounter so far. Asier then hit short down the wall and was beaten by Titin before the pair found themselves comprehensively out-manouevred. Asegarce eyes must have rolled. But then in what seemed a most unlikely turnaround, Patxi and Asier took the next eight points and had their opponents yelling and stamping in fury. The Aspe rot started when Titin miscued carelessly from close in to the frontis, and Olaizola pounced, bossing the great Riojan without any regard for his exalted status. While the man from Goizueta seemed inspired, Titin’s attempted winners appeared bafflingly lacking in bite. Pascual played his part by hitting carelessly short, in stark contrast to a rejuvinated Patxi Ruiz. A mishit from a disgusted Patxi halted the Asegarce run and onlookers must have been tempted to assume that Titin and Pascual would now stamp their authority, but despite their own run of points, Asier fired his pair ahead once again to 9-8. The underdogs built another lead, taking the score to 13-9 in their favour. 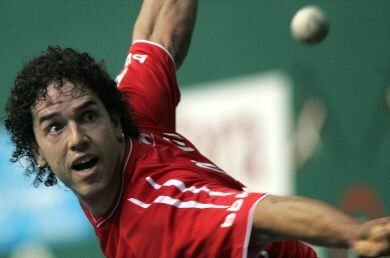 Olaizola managed to partially nullify the Titin factor by hitting long, thus avoiding an ill advised forward battle and Pascual delivered the hoped for errors. However, yet again Titin and Pascual hit back and with the score at 16-16, hearts were in mouths on both sides. When the Aspe pair raced to a 20-16 lead, owing largely to some wayward defensive play from Patxi, surely the die was cast? Titin ensured that this was not the case as his two errors returned Patxi’s favour. With the glimmer of victory only just out of reach, Asier hit again, sending Titin into an undignified full frontal slide into the corner. The final two points were protracted, virtuousic and almost unbearably tense. The advantage ebbed and flowed like an angry river as neither pair would give a centimetre, but once again, Asier, dark curls flying, proved to have the coolest head; a beautifully executed drop shot and an opportunistic long smash sent Titin and Pascual reeling, terminally. And so, not before time, Olaizola I and Patxi Ruiz have a pulsating win in the bag, to add to their somewhat dismal victory over Xala and Zubieta. Titin and Pascual must surely have viewed this match as an opportunity to regain their composure after last week’s rout at their expense by Olaizola II and Mendizabal II. They should perhaps have recalled the hackneyed adage of the wounded but dangerous beast, for the whipping boys tonight put in jeopardy their very survival in this championship. If the pre match press was anything to go by, this encounter was all about the forwards. Aimar Olaizola and Augusto Ibanez are two of the very best of their generation and have a long and turbulant rivalry so it was little wonder that the citizens of Pamplona snapped up the hottest ticket in town in such vast numbers. Their previous encounter in this championship had ended in a win for the Asegarce pair by the narrowest of margins as an injured Olaizola hung on for his life. However, by the evening’s end, the man from Goizueta had left onlookers with no doubts as to who was the king of this particular castle as Titin was left reeling in defeat and boiling over with fury. Right from the off, Olaizola had his rival at his mercy. The cold statistics tell us that he hit nine winners to Titin’s three but figures cannot tell the story of his mastery. The game remained close for the first 16 points but with the score at 9-7 to the Asegarce pair, it was as if a tidal wave hit their opponents. The Aspe partnership were in such disarray that they even committed three errors in mutual understanding, seeming incapable of a decision on who should take the shot. The merciless Olaizola was backed up by a no less magnificent Mendizabal, who hit with control and power in defence and utterly eclipsed Inigo Pascual who seemed a shadow of his former self. The score continued to build in favour of the defending champions, who strolled comfortably to a 15-7 lead. It was then that Titin exploded. Perhaps it was a sense of total impotence in the face of Olaizola that made him react as he did to a gantxo from his opposite number which seemed to fall wide but was called in. The Riojan was incensed and entered into a furious, arm waving row with the judge. Able to take no more, he retired to the changing room, hurling his foot at the door as he went. When he returned, one minute later, he asked for permission to sit at in his chair and gather himself but it was denied. Again he hit the proverbial roof and it was all Pascual and Aspe botillero Martin Alustiza could do to make him continue. Continue he did, but there was no way back. Olaizola and Mendizabal, completely unfazed by the interruption, continued in their dominant vein and refused to cede a single point to their rivals as they completed a 22-7 anihilation. Olaizola and Mendizabal have now won four of their five matches and find themselves at the head of the pack. One more point would guarantee them a place in the semi finals but in the event of a tie their superior points difference should provide a lifeline. Having defeated all of their direct rivals, they are now top dogs. Scoring sequence: 0-1, 1-1, 2-1, 2-3, 3-3, 3-4, 5-4, 5-9, 7-9 and 7-22.